paul gregutt's washington wine blog – unfined & unfiltered: BULLETIN: betz family winery sold! Steve and Bridgit Griessel moved to the US from South Africa nine years ago, where Steve co-founded Tourism Investment Corporation Limited (Tourvest), a publicly traded company in sub-Saharan Africa and the Indian Ocean islands, and Bridgit launched BY Design, which provided marketing and advertising services to clients in South Africa. More recently, they have founded Live Africa, a company offering luxury safari tours. The Griessels plan on moving to Woodinville as full time residents in the near future. By all appearances, this seems to be a positive move for both couples. I am, however, a bit skeptical about the long-term success of the brand when the horizon date for Bob's consultation has come and gone. Maybe they have someone in mind to groom, but they'd have extremely large shoes to fill. Wow......this makes me extremely nervous for the future of the Betz label, which I've enjoyed for years now. I'm selfishly hoping that we don't loose Bob to retirement anytime soon (which god knows he deserves). Also, I wonder how the extremely reasonable (as QPR goes) price point will be effected? I think those are impossible shoes to fill. I wish both families continued success. I'm going to open a "la serenne" tonight to toast them! What happens in 5 years? Who knows? Nothing to worry about, I imagine. Do you think Bob is going to hand things over to a winemaker who wouldn't be qualified? I doubt it. A natural progression based on personal timing. Congrats to Bob, Cathy, Carmen and the whole Betz team as the winery enters a new era! 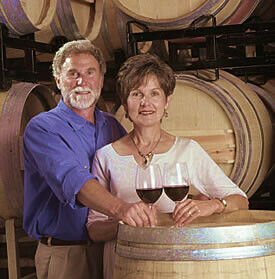 I look forward to seeing what Steve & Bridgit Griessel bring to the future of Betz Family Winery? With a little cooperation from Mother Nature, the next five years should be amazing. Jeff -- you are most likely correct. I would just hate to see anything happen to a brand that has provided us all with such exceptional wines (as well as some pretty nice people!) in Washington. I'm glad to see Bob post on here and be very upbeat. That boosts my confidence even more. Bob, you can hang around as long as you like as far as I'm concerned!! Washington wouldn't be the same without Bob and Cathy Betz behind their oustanding wines. No one does Syrah like Bob. Hopefully not impossible shoes to fill. Best to the Betzs! "Griessel, 51, admits to having “no previous experience running a business in the wine industry. " Like Washington needed another dilettante. Anon - there are dilettantes and there are people who have valuable strengths in marketing and business management and enough sense, humility and confidence to hire out the part they don't do well. Rare indeed is the individual or family who can do it all. Perhaps a little less cynicism on your part, and a little more welcome.